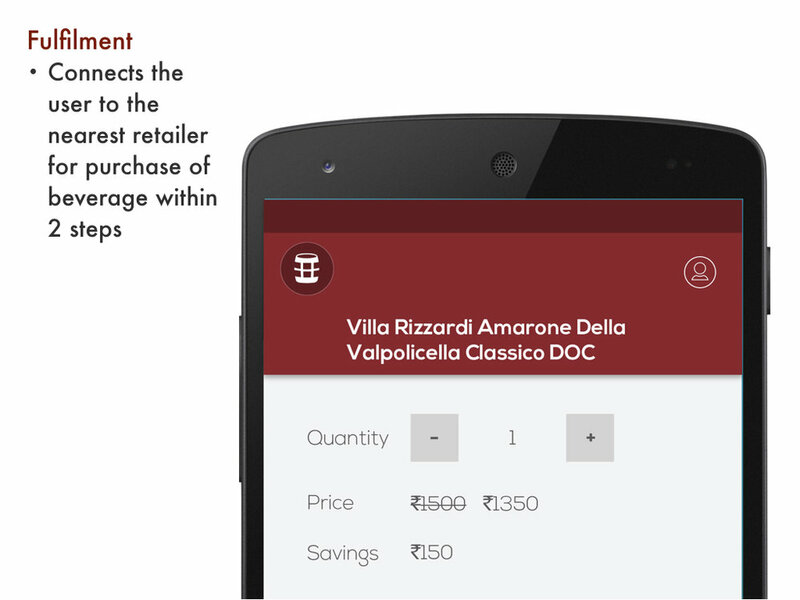 Project Overview: In 2014, as Design Manager at BOLD VC, I worked with the founding team at Hipcask (a wine and liquor discovery platform serving the Indian market) to re-envision the the aim and flow of their primary digital touch point, the mobile app. Previously, the homepage of the app was a bunch of curated & frequently updated articles about wine types and pairings at restaurants. This looked dated and lacked mass appeal. Research: I interviewed telephonically, 10 respondents, half of which were existing users of the existing app. Questions were focussed on Drinking and eating patterns and preferences, Modes and moods of discovery, Spending behaviours and comfort, etc. I also collected related information like online social activities and preferences, decision making factors and influencers. With analysis of the responses, we structured the user base to increase understanding of target audience and refocus features based on the targeted usage scenarios. 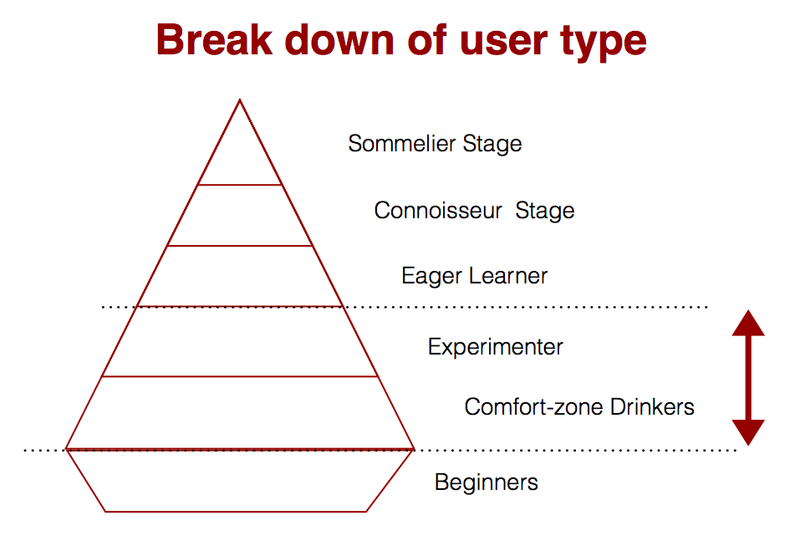 Extrapolating Maslow's Need Hierarchy, we defined our user base and defined the target audience. 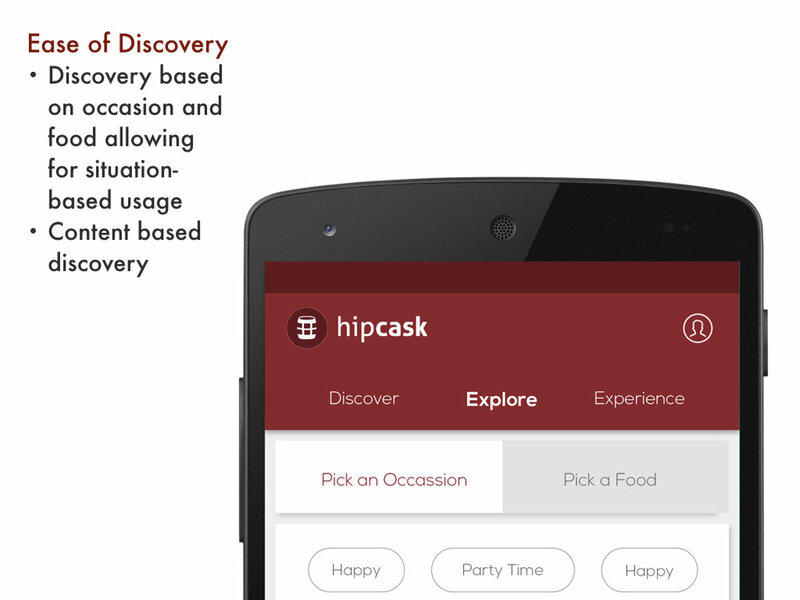 User Type Definition: We realized that for all practical purposes, Hipcask was currently made in such a way that only the power users (connoisseurs / sommeliers) would be able to actually benefit from it. We needed to simplify the app and make it more user-friendly and approachable for two main scenarios: Comfort zone drinkers to be able to directly find and order for their 6 pack for the evening; as well as for the Experimenters to discover and explore variety of drinks based on their mood for the evening. Information Architecture: Keeping some of the existing features like palate profiler, content based discover, we restructured the information architecture to highlight new features built to support our main scenarios. The following are a few before and after comparative screenshots of the app. Before: Home page loaded with content thumbnails on the left. After: Home page with frequently updated mood based tag with an option to quickly navigate to the expert content that some users were familiar with, on the right. Before: Wine detailed page on the left. After: On the right the new design allowed for better readability, glanceability, photo viewing and an option to explore more details about the wine. Project Outcomes: I helped the team transition from a content based discovery model to an more user friendly tag based discovery based wine recommendation engine which would allow a range of users to pick their next wine through Hipcask. This was complementary to their database of wines and liquor, which were already tagged by mood, flavour and food. This redesign helped the application gain a wider user base and allowed the company to lunch in 4 major cities across India. The company has since pivoted to a 'passport' base model but language and features of this redesign are still present in their application.